Offer ends: Apr 25 '19 at 7:45 pm ET Ordering will be unavailable site-wide from Thursday 7:45 PM EDT to Saturday 9:15 PM EDT. Please order before Thursday 7:45 PM EDT to be eligible for this rebate. 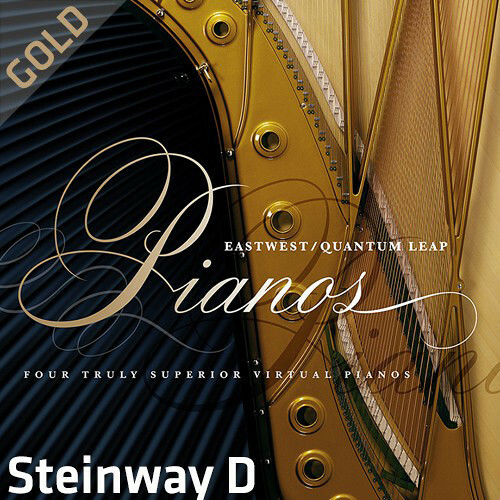 Available for download, the EastWest Quantum Leap Pianos Steinway D Gold Edition is a virtual piano that offers a balanced tone and a wide dynamic range from pianissimo to fortissimo. This 9', 88-key American grand piano can work for a wide variety of productions. The gold edition offers 16-bit samples, rather than the 24-bit samples provided in the Platinum version. It also provides you a single player-perspective microphone position. All of this is useful for people who have slower computers.